Feeble Mind | Posting opinions and arguments without really leaning onto other side is hard…. that is what I'm trying here. Posting opinions and arguments without really leaning onto other side is hard…. that is what I'm trying here. As many of you know, I will be going to Vancouver this fall, studying in the University of British Columbia. This journey will be one of the biggest in my life but I’m not here to talk about that journey today. I’m here to talk to you about my life’s journey. Part of a college application almost always come with an essay (or a short answer.) One common question that comes up year after year is “talk about a person who have inspired you.” Many of you have some straight answers, Martin Luther King Jr.! Mother Teretha! My dad! My counselor! Writing about this seems so easy and standard. I can imagine you, sitting in your desk (or in front of your computer) typing away, creating inspiring words that move the college admission office. But not me, I’m dumb-folded by that question. You must be thinking, “there must be someone in your life that has an inspiration on you right?” The thing is, I may have, but either I have already forgotten or the time I spent getting to know that “inspiration” just wasn’t long enough. In that circumstances, my family must be my inspiration right? They have stuck with me since birth, moved with me everywhere and things. To some extent, that’s true. But mostly, my family is not my inspirations. Now, I can already imagining you protesting: “but.. you love your parents!” Yes, I do love my parents. I appreciate what they have done to me and will always will. But love is different than inspirations. Although this may seem sad but moving around also affected my parents, not enabling them to rise to the highest social status. Also, being a kid, I was clueless to what my dad did except I knew he was teaching in a university. So, as you can see, there aren’t a “single person” who inspired me. But don’t get me wrong, I AM inspired, I DO have a dream. But where did that come from? From many people: people like Spencer West, Efron Penoflorida, my counselor, my parents… all of them create that inspiration. All of them creates a small piece in the inspiration that pushes me. And so, maybe I think it is time we redefined inspiration. Thriller is a genre where it’s hard to do good on. All the logics need to be in place and plausible and it needs to be surprising and understandable at the same time. Hence, there are only a few writers who have been successful at writing in this genre one of whom is Dan Brown with his piece: The Lost Symbol. Right before the story actually starts, Dan Brown treats us with a mysterious ceremony, a style in which Brown has used often is his work.After that, the story starts with the familiar professor Langdon, our Harvard professor whom we are familiar with through “The Da Vinci’s code” as well as “Angels and Demons”. He is just arriving at Boston to deliver a lecture, doing his friend: Peter Solomon a favor. Langdon soon realizes however that he has been called to Boston to take part in a much larger plot (as always.) He then dispatches onto a long journey(640 pages although the entire journey is only about 4-5 hours in the book: 8p.m. until after midnight) to save his friend and uncover the mystery hidden within Washington D.C. The story itself was thrilling with numerous twists that surprise the readers, keeping their interest and urging them to go on. Each new page is a new adventure, seeming to draw the readers into new events, new symbols and new meanings. One method Brown used to keep up this thriller was in use of switching perspectives. From the perspective of Langdon, the protagonist to Mal’akh, the antagonist, Brown jumped through nearly all the characters in the book without getting lost as each character holds a piece of information that others do not have. The adventure soon creates many mind-blowing revelations (as stated in the first page of the book: All rituals, science and facts presented in the books are true), that craves readers into finding out about those subjects even after they have finished their book. My personal favorite was when Katherine Solomon “weighted” a soul. This party of symbols, meanings, puzzles, truth and illusion all help to create a tense, fast yet complex atmosphere filled with tension and realizations. A must read book on my list. In 2010, I attended my first GIN conference. Back then, I went there not knowing what to expect. 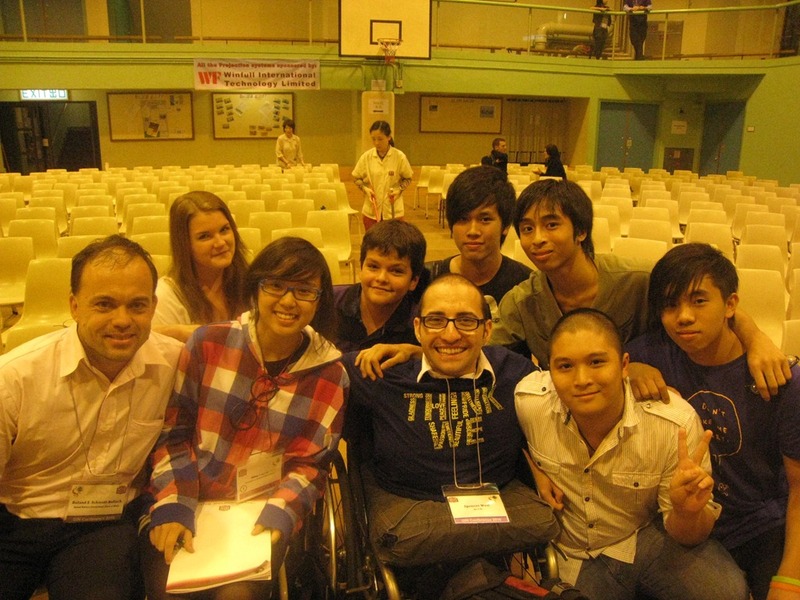 And then I met Spencer West and Efron Penoflorida as well as many other people. They were inspiring, to the point that when Spencer West finished his speech, We were all standing up, sort of wetting our eyes, some even crying. That was when it clicked; and from then on, I was a difference person (warned you of the dramatic awakening ) But hopefully, the end of the conference wasn’t the end of the connections. I was able to connect with one other student, from an International School in Indonesia whom I still keep in contact and who is probably one of my best friend. We stayed in contact and GIN was our frequent topic of discussion. However, nearly all the other students weren’t able to make that kind of connection like I made. They all continued on with their life at their school. And then the next school year came and all of the people who went to GIN in Hong Kong either left or were now Seniors (including me.) So we needed to recruit some new members. Hopefully, our number went up to 15 (from 7 last year.) But due to circumstances, the group was again demotivated and our works were delayed. Simply put, GIN in my school suddenly wasn’t working anymore. In order to solve it, I talked to the person in the Indonesian International school. We talked about defining GIN and what it meant. Why? Because I wanted to go back to the fundamentals, to find our goals. What we came up with was that GIN needs to create a network between different schools to create a difference. Wait wait wait, how does it work? So let’s imagine GIN delegates from 5 different schools meet in the GIN conference. They all developed a connection that they bring back to the school; then these 5 people form a network between these 5 schools such that each year, they will work on a common project (an event that will happen on the same day …etc…). We both agreed that this model will work since it creates the sense that the students are part of something much bigger and also create a sense of competition between schools. With that thought, we went to the conference in JIS, I talked with my teacher about the idea and she was a bit skeptical about the idea although she still encouraged me to make those connections. Throughout the conferences, I made 2-3 connections so that I can contact students in those schools. The night after the first day, my teacher talked to me about how a teacher in GIN had the exact same idea like me and is working on it to take GIN to the next step and part of the plan was to create a committee of GIN alumnus to work on it. So now that my ideas are really being worked through, what should I do? Apply for it continue GIN in my University: UBC. A Special on Youtube about how great things can be! I have to admit, I don’t usually frown over these kind of news. Some will say I may be cold blooded but that’s not true. The truth is, I don’t show sadness that easily. But this time, it was Japan, it was the place I was born and grew up in. It was different. So the entire journey on the bus was filled with bad thoughts, thinking about all my friends and families over in Japan. When I got home, I immediately searched for every piece of news, Japanese, English, Vietnamese, anything I could find and started reading. I also contacted my friends and family members who were living in Japan and asked if they were alright (one responded saying he was fine. Thank you…) And since then, I kept hoping that it’ll be good, Japan is trained to do this, we are trained to handle this, thigns won’t go wrong but I’m not really sure anymore, the death toll is rising, the missing people are rising, the economic consequences are huge… it seems we haven’t hit the bottom yet. Let’s make it clear, we (as in Japanese) are born with the ability to fight earthquakes or rather to live with it. From the experience in Kobe to the little everyday quake you feel, it’s simply embedded into our life. Our buildings, our drills, our stock of emergency food… all of these have prepared us in case of serious Earthquake so I do believe that Japan will handle it pretty confidently. We’re used to it. We’re used to rise up from the rubble to make a new city. My deepest hopes are with all the people of Japan. Recently (or recently I just found out more likely. My stupid Chrome just didn’t updated for like a gazillion years.) 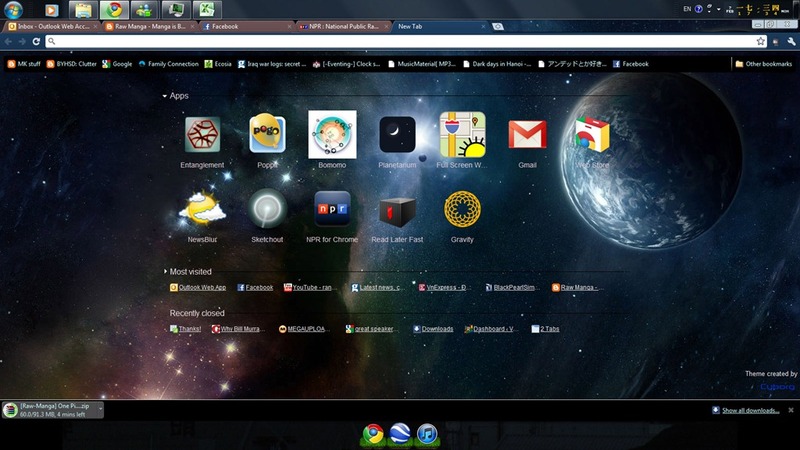 About the Chrome apps and as far as I can tell, they’re pretty awesome. You can check all your RSS, news, Read it later, Check the weather from the about:tab tab. So guys, you know which browser to choose. So what types of aids are good? Education: If we are able to help in anyway then Education is the best way to go. Yeah yeah, I know we all hate school and just want another Summer break (or not, just a hasty generalization I guess) but in some part of the world, kids can’t wait to get into school. But they can’t. In Vietnam, many of the kids don’t even have schools in their area and have to walk ridicules distance to get to the nearest school (about 10-15 kms) this, added with high cost (relative to income) of education has put many kids out of school, helping in their family instead. This is a great place for aid to come in. If they can build a school, if they can get a teacher (who is generous enough) to stay in that school for at least a few years a teach there so that there’ll be an educational basis, it would be great. Something that I haven’t thought of. This list will be added but right now, these two are in my opinion, best ways to give aid. However, it would mean nothing if they can’t use their new found skills and health to productive work. Therefore, job creation must also be implemented.